▪ Material - Made of Genuine Gemstone and Solid 14k Rose/White/Yellow Gold, the ring is proved to be body-safe after rigorous contact test. Without any harmful ingredients, it is nickel-free, lead-free, cadmium-free and anallergic. ▪ Ideal Gift For Your Lover - Come in a jewelry gift box, perfect for any gift giving or Proposal occasion. Great gifts for women, gifts for mom, gifts for mother in law, gifts for wife, gifts for daughter, gifts for aunt, gifts for Girlfriend, etc. Ideal Birthday Gifts, Anniversary Gifts, Christmas Gifts, Graduation Gifts, Mother's Day Gifts, Valentine's Day Gifts, etc. ▪ High Quality - Each of Our Ring is Handmade by Our Professional Jewelry Maker. ▪ 30 DAYS MONEY BACK GUARANTEE - To guarantee your complete and total satisfaction, we offer our customers a 30 Days return policy. Please feel free to contact our customer service anytime if you feel unsatisfied or confused. ▪ Promotion - Save 5% each on Qualifying items offered by MyrayGEM when you purchase 1 or more. Save 10% each on Qualifying items offered by MyrayGEM when you purchase 2 or more. Free Shipping. This brilliant item is crafted from magnificent 14 karat white/rose/yellow gold and complete with a dazzling high polish finish which is sure to catch the eye of anyone who can appreciate it's beautiful design. Order this today or browse our incredible selection of fine gold jewelry. Material - Made of Genuine Gemstone and Solid 14k Rose/White/Yellow Gold, the Jewelry is proved to be body-safe after rigorous contact test. Without any harmful ingredients, it is nickel-free, lead-free, cadmium-free and anallergic. High Quality - Each of Our Jewelry is Handmade by Our Professional Jewelry Maker. 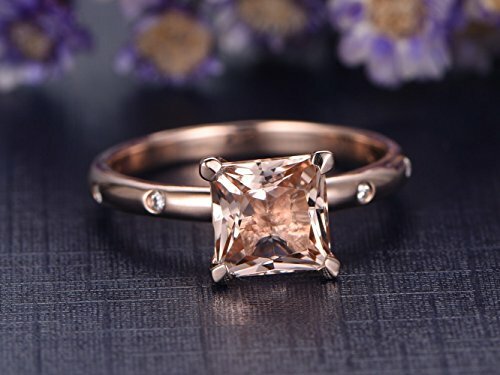 The Gemstone can be replace with the other stone such as Morganite, Aquamarine, Moissanite, Amethyst, Citrine, Ruby, Emerald, Sapphire and so on. If you want to custom your own jewel, just contact with me. If you have any questions about this product by Myraygem, contact us by completing and submitting the form below. If you are looking for a specif part number, please include it with your message.